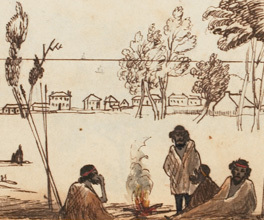 In 1837, John Batman's positive reports of Melbourne saw a surge of people rushing south, clearing the land of trees and scrubs to make way for new housing. Makeshift tents and huts sprung up along the Yarra, to house the flock of newcomers to the colony. Surveyor James Williamson described the town in 1839 as having a concentration of huts along Flinders Street, mixed with a much greater number of timber and brick houses, even an occasional double-storey building. The city was prospering. The colony grew fast and many people moved to the country to set up sheep and cattle runs. Between 1841 and 1849, the number of sheep increased from 780,000 to 5,130,000, and cattle from 51,000 to 390,000. The proportion of the population living in Melbourne decreased, but city land sales boomed. The government made half-acre lots available in Melbourne for low prices, and settlers raced for the bargains. In a few years, the buyers were subdividing their land and selling it for huge profits – up to 60 times what they had paid. The selling continued, the prices of goods and property soared and the colony's economy rose with it. In 1841, however, it became clear that city investors had over-extended themselves and could not keep up the rate of development. Land prices began to fall. Expensive buildings went up without payment and, consequently, workers went unpaid. By 1842 the colony was in the grip of a depression. This lasted until 1843 when – slowly, and through hard work – businesses began to recover. Land sales resumed cautiously at reasonable prices and production on the land approached normality. The government resumed mass immigration, and the increased workforce helped grow businesses cheaply. By then, nearly all the land in Melbourne was privately owned. Melbourne is daily increasing in importance, and Town property is steadily increasing in value. I may safely assert that you would not know Melbourne again...the vast increase in size...the improvement in style. Cannon, M 1991, Old Melbourne town – before the gold rush, Loch Haven Books, Main Ridge, Vic. Although the settlement grew rapidly before 1851, the gold rush transformed Melbourne almost overnight. Lavish buildings shot up everywhere, and cultural institutions – like the State Library of Victoria – began to develop. Indeed, Melbourne had survived the depression, and the bustling city that we know today was beginning to take shape.